NETWORK FINALS: There were 0.1 bumps in final numbers for NCIS, THE VOICE and THIS IS US, while LAW & ORDER: TRUE CRIME and BLACK-ISH lost the same. CABLE HIGHLIGHTS: The NBA regular season has begun, and it gave TNT’s doubleheader the night’s victory, with the Boston vs. Cleveland game at 2.53, and Houston vs. Golden State at 1.93. Sister network TBS also succeeded with sports, as the NLCS playoffs game was at 1.84, while Fox Sports 1’s ALCS game was at 1.16. The highest-rated non-sports telecast of the night was FX’s AMERICAN HORROR STORY: CULT, down 0.07 to 0.97. The premiere of THE MANE EVENT on BET was at 0.74, after lead-in TALES collapsed by 0.26 to 0.25. 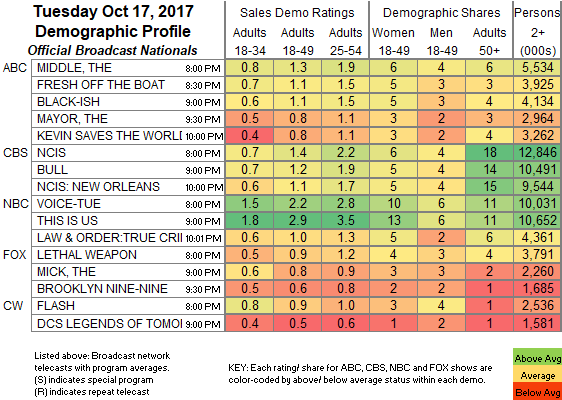 On USA, WWE SMACKDOWN dropped 0.07 to 0.73, CHRISLEY KNOWS BEST lost 0.09 to 0.51, and ACCORDING TO CHRISLEY was down 0.08 to 0.27. Bravo’s BELOW DECK shed 0.04 to 0.50. MTV’s THE CHALLENGE slipped 0.02 to 0.46. OWN’s IF LOVING YOU IS WRONG gained 0.02 to 0.44. On History, FORGED IN FIRE dropped 0.07 to 0.44, and COUNTING CARS was at 0.26/0.23, compared to last week’s 0.38/0.37. On Comedy Central, TOSH.0 rose 0.06 to 0.36, and THE JIM JEFFERIES SHOW was up 0.03 to 0.20. A&E’s LEAH REMINI: SCIENTOLOGY & THE AFTERMATH fell 0.08 to 0.35. Nickelodeon’s late afternoon LOUD HOUSE was at 0.34. MSNBC’s RACHEL MADDOW SHOW topped cable news in the 18-49 demo with 0.32/0.46/2.4M, with Fox News’s HANNITY ahead with 25-54s at 0.31/0.54/3.2M, and CNN’s ANDERSON COOPER 360 at 0.19/1M. On ID, DEAD SILENT arrived at 0.29, and KILLER INSTINCT was at 0.21. 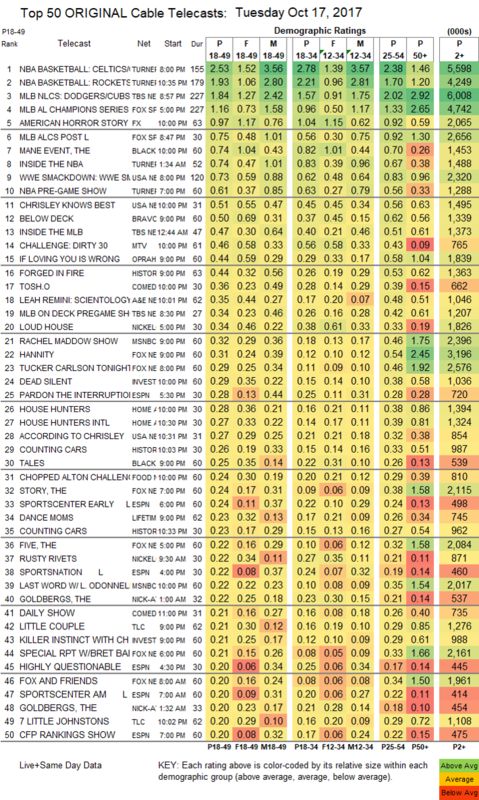 On HGTV, HOUSE HUNTERS dropped 0.07 to 0.28, and HOUSE HUNTERS INTL was down 0.04 to 0.27. Food Network’s CHOPPED fell 0.11 to 0.24, and CHOPPED JR was down 0.07 to 0.17. Lifetime’s DANCE MOMS climbed 0.02 to 0.23. On TLC, THE LITTLE COUPLE dipped by 0.02 to 0.21, and 7 LITTLE JOHNSTONS ticked down to 0.20. On Tru, ADAM RUINS EVERYTHING ticked down to 0.19, and YOU CAN DO BETTER was up 0.05 to 0.10. Spike’s INK MASTER: ANGELS held at 0.17.